As Napoleon's troops prepared for their final battle against the armies of England and her continental allies, England's second war against the United States seemed far removed from her vital national interests. Naval defeats on the Great Lakes made it impossible to successfully prosecute the war, and Jackson's defense of New Orleans had dampened the Foreign Office's enthusiasm for a military victory. During the two years of hostilities, however, while victory eluded the British, harassing actions continued on the high seas and commerce was disrupted whenever possible, affecting many aspects of American life. 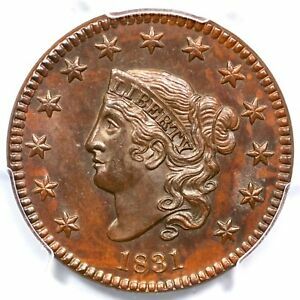 By 1814, U.S. copper coinage had also become a casualty of the war. For more than twenty years the Mint had purchased blank, copper planchets from the English manufacturer, Boulton & Watt of Liverpool. 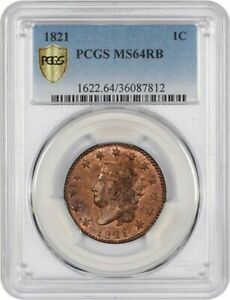 Early in the war supplies stopped, and by 1814 the last of the imported copper blanks had been turned into cents of the "Classic Head" design. 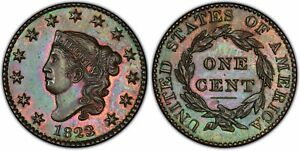 Although no copper planchets were available for coinage in 1815, this idle year proved useful, as it allowed a new obverse design to be engraved for cents and marked the beginning of a new era of mechanization and uniformity. The Mint had been harshly criticized since it struck its first coins in 1793. As an institution it had become increasingly sensitive to public ridicule. Shortly after the Classic Head cent was introduced in 1808, critics pointed out that the fillet on Liberty's head had not been worn by women in Classical times but was given as a prize to boy athletes who had won town games. Desiring a new design, but wishing to avoid further embarrassment, Mint officials bypassed Assistant Engraver John Reich (who they had previously chosen over Chief Engraver Robert Scot to create the Classic Head) and assigned Scot to redesign the cent. Scot's creation went into production in 1816 and was a resounding artistic failure, but it did have one redeeming quality: no one could mistake the new Liberty for a boy athlete. The new design featured an enlarged head of Liberty. The fillet holding the hair on the previous Classic Head series was replaced by a coronet and the word LIBERTY was added in relief. The reverse was essentially unchanged and retained the "Christmas wreath" of Reich's 1808 design. While generally referred to as the "Coronet" type, this is not a universally accepted name. Some collectors prefer "Matron Head." Dr. William Sheldon, author of the standard reference for cents struck from 1793 to 1814, scathingly remarked that the figure of Liberty on these coins "resembled the head of an obese ward boss instead of a lady." During the 24 years of the Coronet design (1816-1839), the Philadelphia Mint produced a total of 51,706,473 pieces. Among numerous overdates and varieties, one in particular stands out: 1817 with 15 stars on the obverse. Why this coin has 15 stars is still a subject of debate, but one theory has it that Scot erred while punching in the devices and spaced the first several stars too close to one another. Wishing to save the die, he added enough stars to balance the design, exceeding by two the normally required thirteen stars. 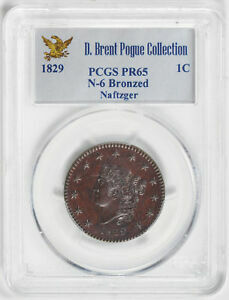 While none of the dates in the series are outstanding rarities, the "key" date is 1823. It is scarce in all grades. Although counterfeits in the series are rarely seen, several generations of restrikes for the 1823 cents exist, each with successively larger and larger die breaks on the obverse. The years of 1835 through 1839, redesigned by either William Kneass before his stroke or Christian Gobrecht afterward, are considered transitional, and while the design differs in several significant aspects, these years are generally collected within the Coronet series. In 1839, four different varieties were struck, among which are two of the most widely collected in 19th century numismatics: the so-called Silly Head and the Booby Head. Proofs are very rare and were generally made only for diplomatic presentation sets. Several dates are reported to have a proof finish on the obverse and mint frost on the reverse. Allegedly, these "one-sided proofs" were struck for collectors who wished to display their coins with the obverse side up and did not care how the reverse was finished. Grading Coronet cents is relatively uncomplicated due to the coin's simple design. Wear first shows on the highpoints of the hair curls and on the highpoints of the leaves. A caveat, however: Many copper collectors use grading standards agreed upon by the Early American Coppers Society, and application of these standards can be quite confusing to non-specialists. Collected as type coins, by date and by die variety, Coronet cents are a fascinating series. 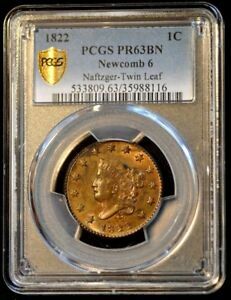 For the variety specialist, the standard reference is Howard Newcomb's United States Large Cents 1816-1857. Due to a numismatically fortuitous event over 125 years ago, the condition conscious type collector will find this series particularly interesting. Shortly after the Civil War, a large keg was found beneath an old railway platform in Georgia. 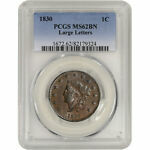 Upon opening, it was discovered to contain approximately 14,000 large cents dated from 1816 through 1820. All the coins were uncirculated, but many showed carbon flecks from moisture in the atmosphere. The keg was sold to a dry-goods merchant in Norwich, New York who attempted to pass the old coins out to customers as a publicity stunt, but many people refused what was by that time an unfamiliar coin. The remainder of the keg was sold to John Randall, a Norwich coin collector, for 90 cents on the dollar. Randall sold the coins off slowly over the years, in spite of the rumors that they were restrikes. In 1878, as part of Randall's estate, the remaining 2,116 Coronet cents from the hoard were sold at public auction. The 1819s brought $1.28 each, but most of the other dates realized only 5-7 cents apiece. Almost all mint state cents from 1816-1820, many of which still possess original mint red color, are from Randall's hoard. Dates from the 1820s, however, are quite rare in mint state. When new in 1816, the Coronet design represented the latest in mint technology and design. But by 1839 both design and manufacturing methods were overtaken by the advent of the steam powered coin press. New designs were the order of the day, and the old Coronet cent passed into the quaintness of a bygone era, replaced by Christian Gobrecht's Braided Hair design. Bowers, Q. David, United States Copper Coins, An Action Guide for the Collector and Investor, Bowers and Merena Galleries, Wolfeboro, NH, 1984. Bowers, Q. David, United States Coins by Design Types, An Action Guide for the Collector and Investor, Bowers and Merena Galleries, Wolfeboro, NH, 1986. Newcomb, Howard R., United States Copper Cents 1816-1857, Quarterman Publications, Lawrence, MA, 1991. Noyes, William C., United States Large Cents 1816-1839, Published by the author, Monument Beach, MA, 1991. Wright, John D. The Cent Book 1816-1839, Published by the author, St. Joseph, MI, 1992.